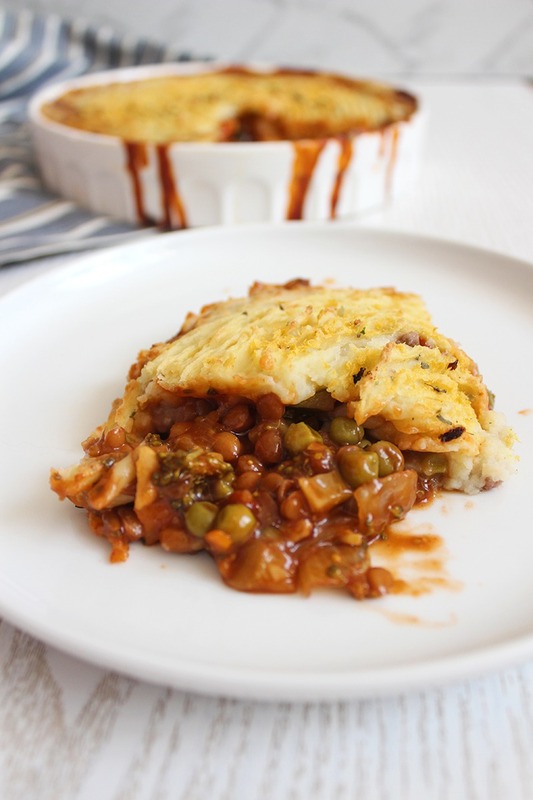 Shepherd’s Pie is traditionally a casserole made with a bottom layer of veggies and meat cooked in a rich and velvety gravy. 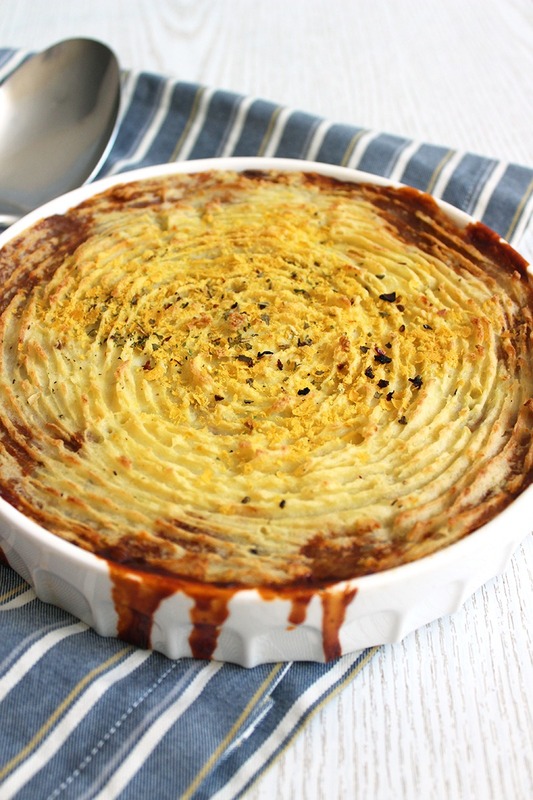 Then topped with a layer of creamy mashed potato and baked until golden and crispy. While this is traditionally a non-vegan dish, I’d never made it before becoming a vegan. I’d of course been served it by family or while eating out but never made it myself, so I’m certainly no expert on what goes into it precisely. However, I do fondly remember the smells, tastes and textures. 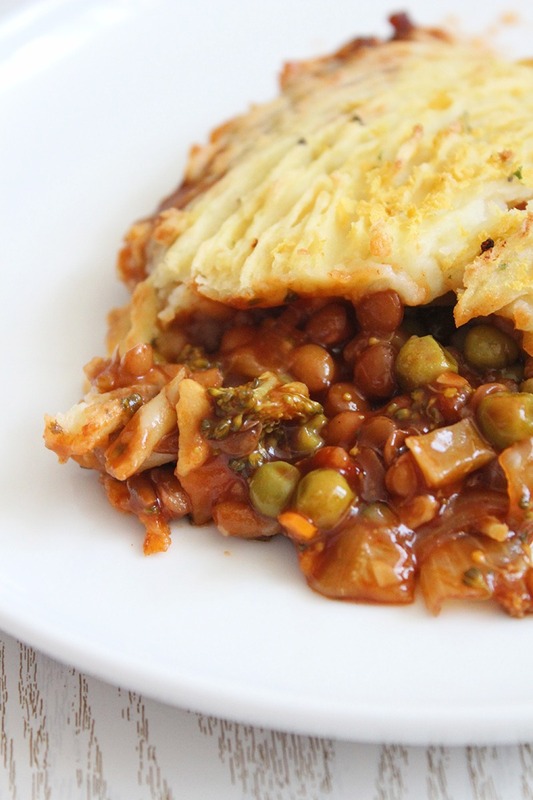 I based this vegan version of a Shepherd’s Pie on those memories and it’s (according to me) even more delicious. Of course, this dish is wonderful to make for holiday meals! It’s also a really good way of using up all of the left-overs commonly in the fridge the day after. 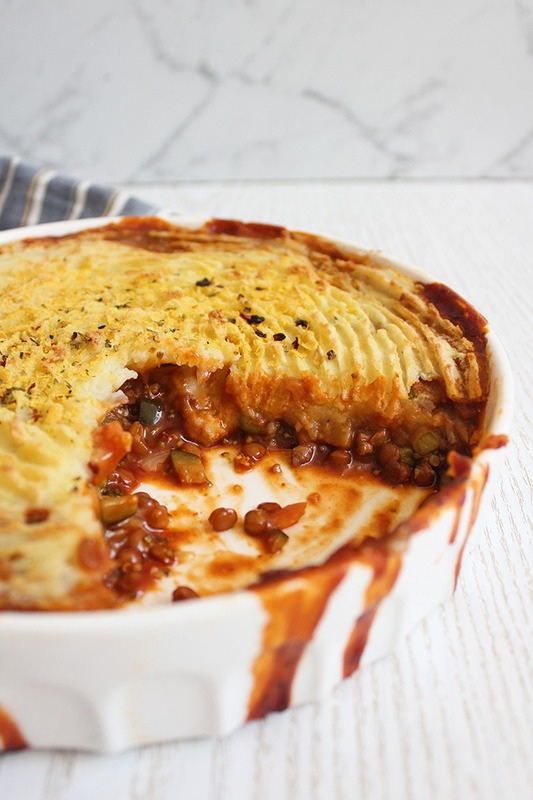 You can use left-over veggies for the filling and, I don’t know about you, but there is nearly always loads of mashed potato left in my family. Not that we don’t love it. 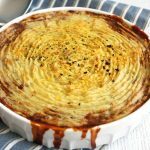 This Shepherd’s Pie is thick, chunky, rich and tasty with flavours that will make you think of winter stews and family feasts. It’s made its way into our dinner meal rotation as it’s also easy enough to cook on a regular weekday, particularly one that is cold and wintery. I hope you love this delicious recipe as much as I do! If you make it, be sure to share a photo with me on Instagram @lemonthy.me I’d love to see them! Also feel free, as always, to leave any questions, comments or suggestions below. Preheat your oven to 200°C (390°F) and heat 1/2 tablespoon of oil in a large frying pan. Finely dice the veggies and add the onion, mushrooms and garlic to the frying pan. After they’ve softened slightly, add the rest of the veggies and let them soften too – stirring occasionally – for about 7 minutes. Chop the potatoes into roughly 2cm chunks and put them on the stove to boil. Drain and rinse the can of brown lentils and add them to the frying pan. Along with the tomato paste, soy sauce and maple syrup. Stir so that everything is coated. In a small bowl whisk together the arrowroot flour with 1.5 cups of water. Once it’s smooth, stir it into the filling mixture and let sit on a low heat for 5 minutes. Use this time to drain, rinse and mash your potatoes with the vegan butter, nutritional yeast flakes, salt and pepper. Pop the filling into a casserole dish, spread the mashed potato evenly on top then sprinkle with some extra nutritional yeast, salt and pepper if you’d like. 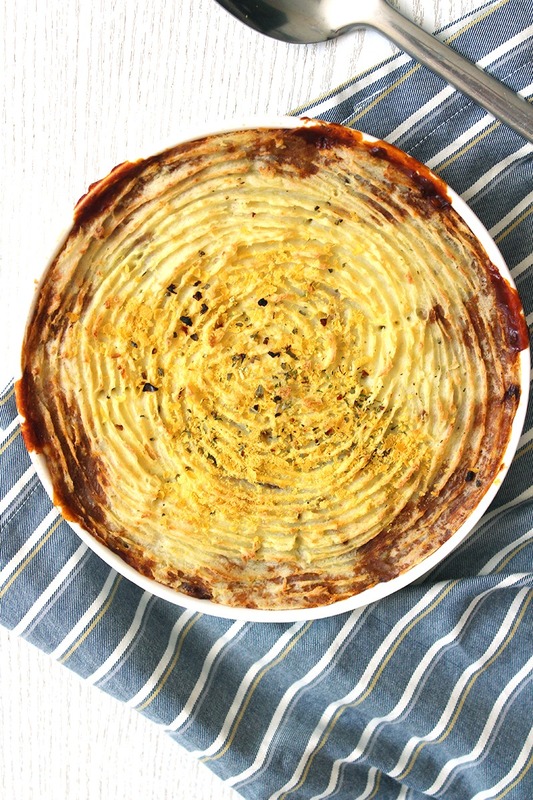 Put your shepherd’s pie in the oven for approximately 30 minutes or until the potato has started to turn light golden on top. Let it cool down considerably before serving. Enjoy!